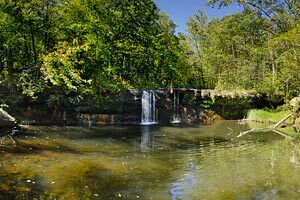 Welcome to the Banning State Park virtual tour! 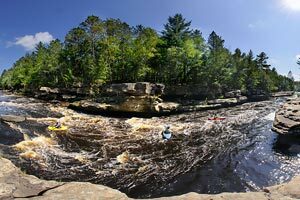 A whitewater canoeist or kayaker's dream, the Kettle River borders the entire length of this park. 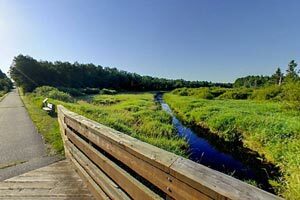 Hikers and campers also have plenty to explore from breathtaking scenery to historic buildings. We hope the tour prompts you to visit the park in person sometime soon. 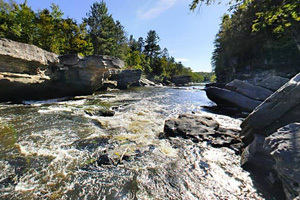 The Kettle River borders the entire length of Banning State Park, and offers one of the state's most challenging whitewater experiences for kayakers and canoeists. Rapids along this popular stretch of the river range from Class I to IV and vary depending upon river volume. This landing offers a small parking area and carry-in access for canoes and kayaks. Water tumbles over sandstone ledges and rocks, forming the Blueberry Slide Rapids. These rapids are considered to be some of the most challenging along the park. Frothing water carries kayakers over a series of rock ledges that form the Mother's Delight Rapids. The start of the Dragon's Tooth rapids can also be seen downriver in the distance. Kayakers play in the rushing water below the Dragon's Tooth Rapids, some of the most challenging rapids along the park. Small kettles, or holes drilled in the rock by swirling water and sediment, can be seen in sandstone outcrops just downstream. 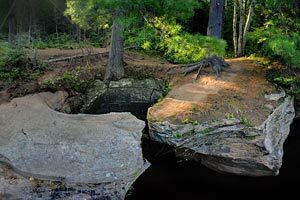 Take the wooded Quarry Loop Trail and experience beautiful views of the Kettle River carving its way through sandstone bedrock. The Little Banning Rapids can be seen downstream from this point along the trail. During the 1800s, a sandstone quarry was developed near the area now known as Hell's Gate. Hikers on the Quarry Loop Trail pass the remnants of a historic building once used by the quarry. Sandstone rock was crushed and sorted here before it was loaded onto railroad cars for transportation. 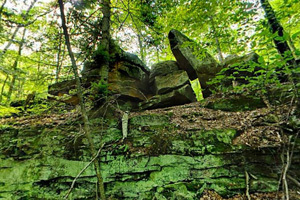 This trail loops beneath lush trees and past jutting outcrops of sandstone covered with intricate mosses and lichens. The durable strength and warm pink color of the local sandstone made it very popular for building construction. 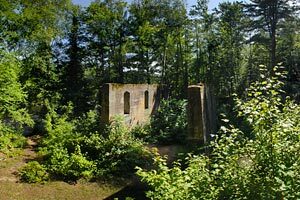 The remains of an old quarry cutting house (which cut large rock into squared units) can be found nearby. Most of the trail follows an old railroad bed, making for an easy 1.8 mile hike. Alongside a stretch of calm water, visitors may spot unusual holes in the sandstone. These holes are called kettles and were drilled many years ago by swirling sand and water as the river valley was being formed. 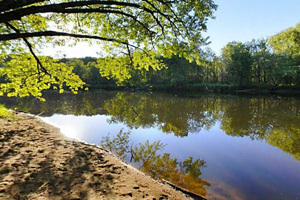 Trees dig their roots into sandy soil along the river just upstream of the Hell's Gate Rapids. This half mile section of trail is more challenging to hike with narrow passages and steep drops. It is not recommended for small children. Sandstone walls gradually come closer to the Kettle River with a final dead end just before the last rapids (Hell's Gate). The trail eventually ends at rock slabs protruding into the river. This is the start of the Hell's Gate Rapids. Look for the Kettle River tumbling over sheer ledges downstream on the river right. 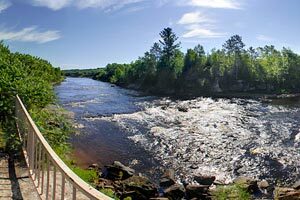 The Kettle River was designated as the first Wild & Scenic State River in Minnesota in 1975. A small waterfall drops 12 feet where the spring-fed Wolf Creek meets the Kettle River. After parking next to the picnic area, visitors can reach this view during a 3.4 mile roundtrip hike on a portion of the Quarry Loop Trail, Deadman's Trail, and High Bluff or Wolf Creek Trails. 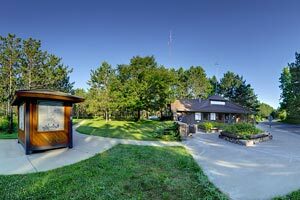 The wooded campground at Banning State Park offers 33 campsites (11 electric) and a restroom/shower facility. 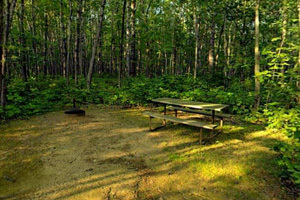 Campers can enjoy the use of a fire ring and picnic table at each site. This cozy camper cabin is set in the woods with a picnic table and fire ring just outside. 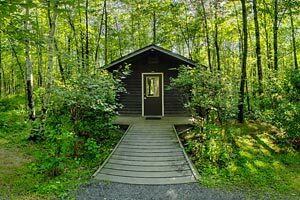 The seasonal cabin is handicap accessible and offers a full-size bed and three twin beds within. A shaded picnic area offers the perfect place to enjoy a meal with family and friends. 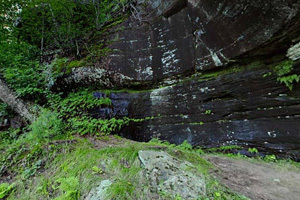 This unique area offers four individual picnic sites just off the Teacher's Overlook Trail. 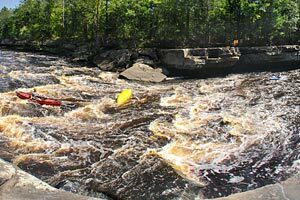 Picnickers may enjoy watching experienced canoeists paddle the Kettle River rapids just below. 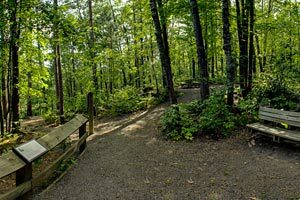 A short (150 yards) handicap accessible trail leads visitors to a rocky overlook. Below is a stunning view of a section of the Hell's Gate Rapids, including portions of Blueberry Slide, Mother's Delight, and Teacher's Pet. Interpretive panels at the overlook share information on the park's unique geology and wildlife. Visitors who wish to relax will find several nearby picnic tables, one of which is handicap accessible. Stop inside the park office to purchase a vehicle permit, register to camp, shop at the gift shop, or learn more about park trails. An interpretive kiosk located just outside the building shares the story of the area's development during the 1850s. At that time, a road known as the Government Road was being built between the cities of St. Paul and Duluth. The road was part of a network of military roads built by the federal government for the defense of the Minnesota Territory. A one mile blacktop trail starts near the park office and extends to MN Hwy 23, spanning Wolf Creek with a small wooden bridge along the way. Bikers can continue on from the trail to the city of Sandstone or the Willard Munger State Trail by traveling on a wide road shoulder. The distance from the park to the Willard Munger State Trail is 7 miles. 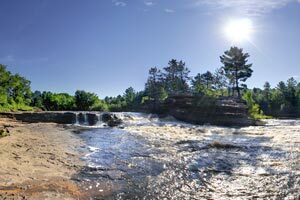 The Big Spring Falls are located 1.5 miles south of Sandstone, Minnesota. 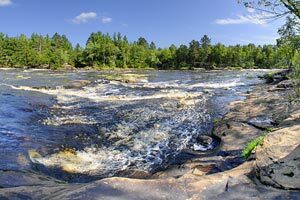 A short hiking trail (¾ miles roundtrip) offers scenic views of an island with the falls on one side and rapids on the other. The name Big Spring refers to a large spring located on the opposite side of the river. Uniquely tinted blue-green water bubbles out of this aquifer and creates a large pool. The Big Spring Falls were uncovered in 1995 when the Kettle River Dam (½ mile downstream) was removed. This was the original location of the Kettle River Dam and its electric power station. The dam was removed in 1995, exposing Class II rapids. This overlook can be reached by the trail from Big Spring Falls (1.5 miles roundtrip). 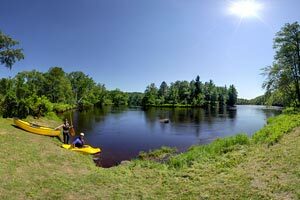 This canoe-in campsite is located along the Kettle River a half mile upstream of the MN Hwy 23 Bridge. The site is nestled in a low land area brimming with ash trees. Visit the site during the spring and expect a carpet of blooming blood root and trout lilies. Pack your fishing pole and you may catch bass, walleye, or northern pike. This canoe-in campsite is one of four available at the park. 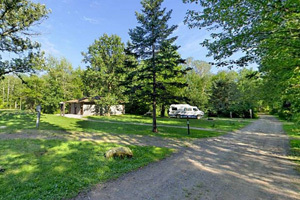 If you are looking for a quieter camping experience, then this is the site for you. 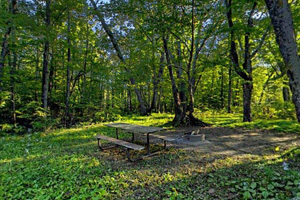 Each site offers campers a picnic table, fire ring, and grassy tent area that can accommodate up to two tents. A rustic open-design toilet is located 200 feet from campsite. This gravel landing is located at the MN Hwy 23 Bridge. 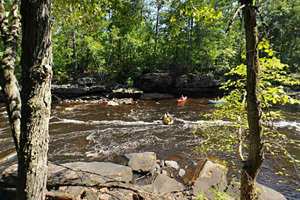 It is a popular take-out point for canoeists that start their trip on the upper sections of the Kettle River prior to reaching the Hell's Gate Rapids (one mile downstream). 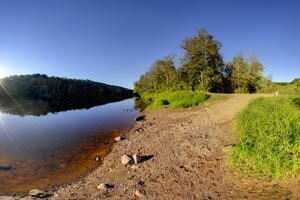 The landing is also used by small fishing boats who wish to access sections of the upper and lower Kettle River.